It is extremely important to robust the delivery process and optimize storage to bring efficiency in the entire supply chain operations. To enhance the process reliability and the performance of the store, increasing the information visibility is quite vital. Exchange of critical information in real time boosts the brand image and build the better nexus with the customers in the long-run, which ultimately results in improved margins. Along with the front-end, it is quite crucial to have a clearly visible back-end SCM operations in place. To maintain transparency at each level, it is extremely important to create and develop infrastructure, use technology and manpower properly. “As execution goes, SCM needs to aim to be completely silent and invisible by ensuring processes are in automatic mode rather than in fire-fighting mode,” believes Abhik Saha, Director, Supply Chain, Benetton India. These days most retail companies are seeking the help of third party logistics; however, there are few which have their in-house supply chain for back-end operations. In both the cases challenges are unique. Addressing the challenges of in-house supply chain, Vineeth Purushotaman, Senior VP - Technology and Supply Chain, HyperCity Retail India, says, “We are struggling to improve vendor transparency. We have close to 1,000 vendors, and they do not have the same structure for data sharing because of their distinguished data synchronization systems.” Vendor scheduling (that includes what warehouse should be expected to receive on a particular day from the vendor) is yet another important aspect to deal with. Internationally, the picture is more improved as there are strict norms for dispatching and receiving of goods, and those are followed quite strictly. However, majority of companies using third party logistics point out that poor transportation is the biggest hurdle. Besides, mis-routing of shipment is quite common. 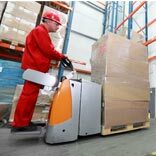 Technology is a vital part to have seamless SCM operations. Enterprise Resource Planning (ERP) is the software being used by many retailers, which can be tailored to meet the specific needs of the industry. The companies including HyperCity are using Vendor portal. It provides a single web interface for suppliers to log-in and view open orders and queries as well as to submit information such as electronic invoices, delivery notifications, schedules, acknowledgements and more. Besides, the use of Warehouse Management Software is also quite prevalent. To have a seamless supply chain operations, there is an urgent need for data centralization. Proper standards or norms should be designed for data sharing between vendors and retailers, so that retailers can get constant information flowing in from the vendor. Advanced supply chain portals can also be developed connecting supplier to warehouse network. With the help of these solutions, everybody will have an equal visibility once the order is placed.